Matisse Thybulle was all over the court for the Huskies this season and is now all over the post-season trophies, winning a second defender of the year award. The college basketball nation is recognizing what the Pac-12 Conference has known for the past couple of years — Matisse Thybulle is the best there is when it comes to defense. The award, presented Sunday by the Atlanta Tipoff Club in Minneapolis, site of the Final Four, is in its second year. Last week, he won the Lefty Driesell Award for the same feat, presented since 2010 by CollegeInsider.com. “Defense is exciting, and I believe we showed people that this year,” Thybulle said in a release by UW. “I’m just happy to represent this program on this stage because there are big things coming for the Huskies. The two-time Pac-12 Defensive Player of the Year had 126 steals and 83 blocks for a combined takeaway total of 209, which led all finalists for the Naismith honor. His steals set the league single-season record, previously held by Jason Kidd of Cal (1992-93), and are the 10th most in a single season in NCAA history. 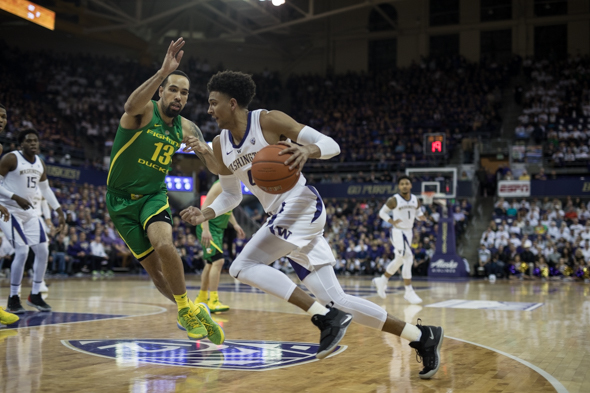 Thybulle, who started all 135 games of his career, owns the Huskies’ career steals record of 331 and passed Gary Payton (321 steals, Oregon State, 1986-90) for the Pac-12 career record. “What an incredible honor for Matisse and so well deserved,” coach Mike Hopkins said. “I’m so glad the Naismith Defensive Player of the Year award exists now because it really recognizes the effort that goes into the sport. Th4 6-5 Thybulle’s blocks ranked second in the Pac-12 and were most by a guard. He was the only player in the country to be ranked in the top 20 in steals (3.5, first) and blocks (2.31, 18th). Thybulle, from Issaquah and Eastside Catholic High School, was the only player in the past 20 seasons to record 100 steals and 70 blocks in the same year, and is also one of three in that span to average two blocks and two steals in a season, joining Shane Battier of Duke (1999-2000, 2000-01) and Nerlens Noel of Kentucky (2012-13). Washington reached its first NCAA Tournament appearance since the 2010-11 season, finishing 27-9, its most wins since 2004-05. I hope he can get a chance to exhibit his skill set in the NBA which could use a renewed emphasis on defense and perhaps start a reversal of the current trend and make professional basketball interesting again. I think he would be a quality role player in late game situations. A more athletic Nate McMillan? Well deserved. Hope the NBA can find room for a player with his skills. Gotta be a sixth man role for him. Is he one of the ten greatest Husky hoopers of all time? Houbregs, Hawes, Edwards, Welp, Schrempf, Roy, Robinson, Thomas, then it gets hard.